Algan, Y, and P Cahuc (2010), “Inherited trust and growth”, American Economic Review 100(5): 2060-2092. Berger, T, and P Engzell (2019), “American geography of opportunity reveals European origins”, Proceedings of the National Academy of Sciences, March. Black, S E, and P J Devereux (2011), “Recent developments in intergenerational mobility”, in O Ashenfelter and D Card (eds. ), Handbook of Labor Economics, vol. 4, chapter 16, pp. 1487-1541, Elsevier. 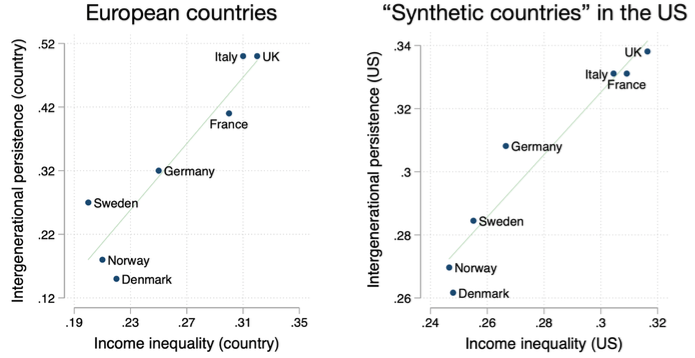 Jäntti, M, and S P Jenkins (2015), “Income mobility”, in A B Atkinson and F Bourguignon (eds. ), Handbook of Income Distribution, vol. 2, chapter 10, pp. 807-935, Elsevier. Luttmer, E, and M Singhal (2011), “Culture, context, and the taste for redistribution”, American Economic Journal: Economic Policy 3(1): 157-79. Sequeira, S, N Nunn and N Quian (2019), “Immigrants and the making of America”, Review of Economic Studies, forthcoming. Piketty, T (2014), Capital in the twenty-first century, Belknap Press. Rice, T W, and J L Feldman (1997), “Civic culture and democracy from Europe to America”, Journal of Politics 59(4): 1143-1172.